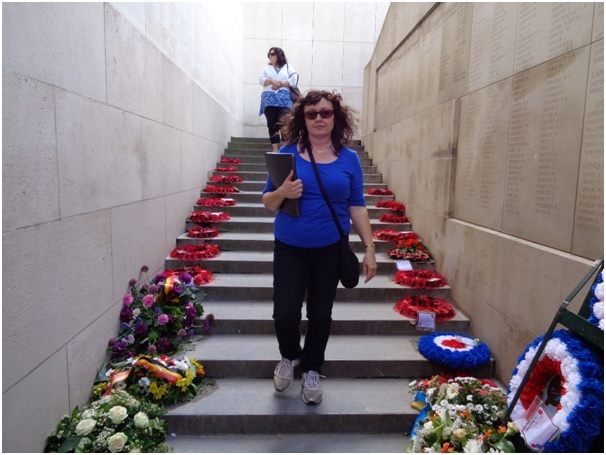 On Monday 1st September 2014 Stephen and I drove to Fromelles (Pheasant Wood) Military Cemetery, which is located in the village of Fromelles in the Nord/Pas de Calais region of Northern France, 104 km south east of Calais, and 22 km west of Lille. 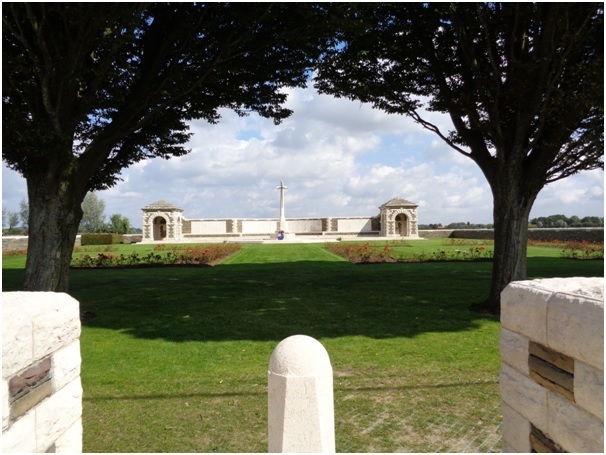 According to the Commonwealth War Graves Commission website http://www.cwgc.org, Fromelles (Pheasant Wood) Military Cemetery was completed in July 2010, and was the first new war cemetery to be built in the last fifty years by the Commonwealth War Graves Commission. A new information centre has been constructed at the site since our last visit in 2012. 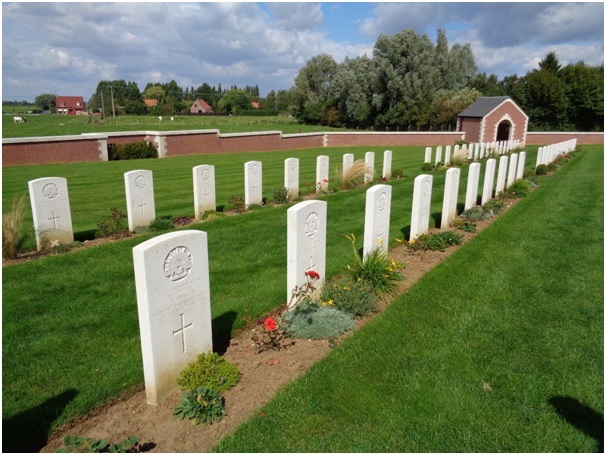 There are 250 Australian and British soldiers buried in this cemetery, whose remains were removed in 2009 from some mass graves located behind Pheasant Wood, where they had been buried by the Germans after the Battle of Fromelles on 19-20 July 1916. 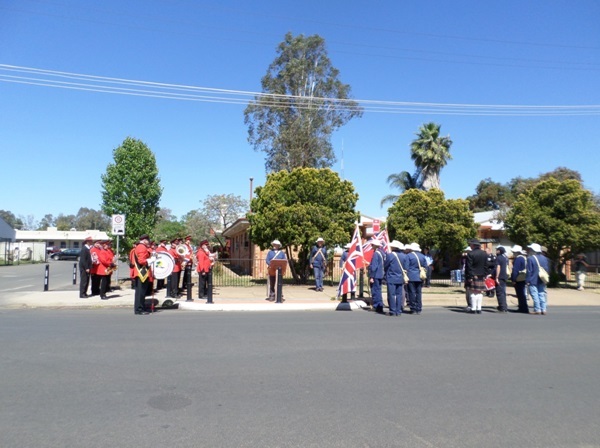 Joseph Patrick Wallis (Wailes), who gave his occupation on enlistment as seaman per his service record when he joined the Coo-ees at Dubbo, is the only Coo-ee buried in this cemetery. He was killed in action at the Battle of Fromelles on 20 July 1916. 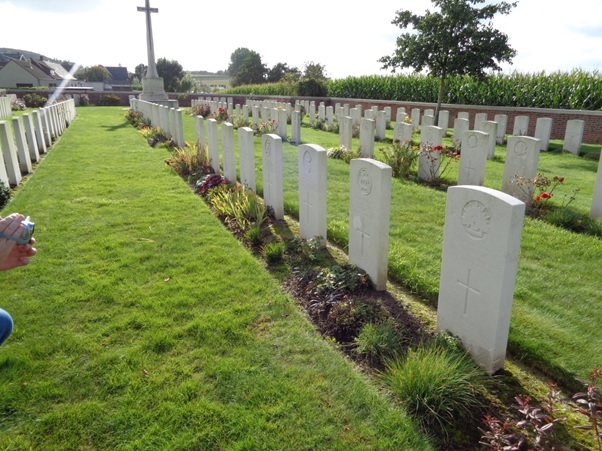 The photograph below shows Joseph Patrick Wallis’ headstone (1st on left) at Fromelles (Pheasant Wood) Military Cemetery. A photograph of the headstone on Joseph Patric Wallis’ grave will be placed on his individual blog entry, and form part of a Roll of Honour for the fallen Coo-ees on this blog. His name is also recorded on the memorial wall at V.C. Corner Memorial and Cemetery. 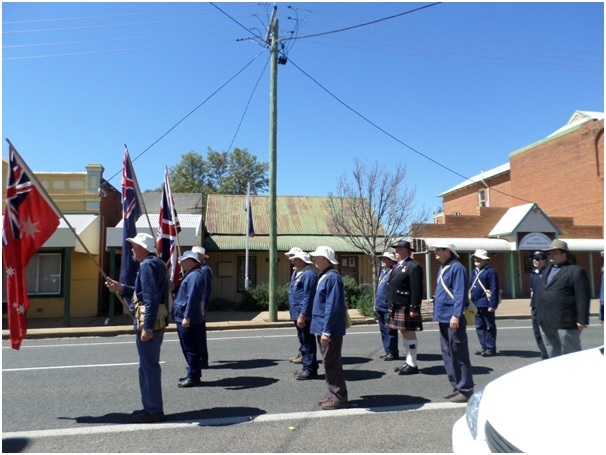 On Monday 1st September 2014 Stephen and I drove to V.C. Corner Australian Cemetery and Memorial, which is located 2 km north-west of Fromelles, in France. 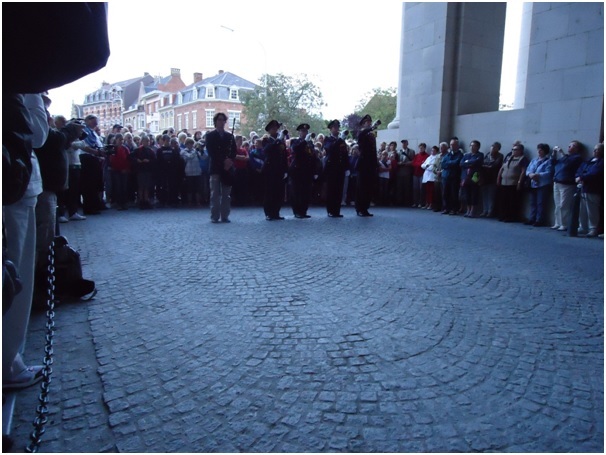 According to the Commonwealth War Graves Commission website http://www.cwgc.org/, V.C. Corner Cemetery is the only uniquely Australian cemetery on the Western Front. 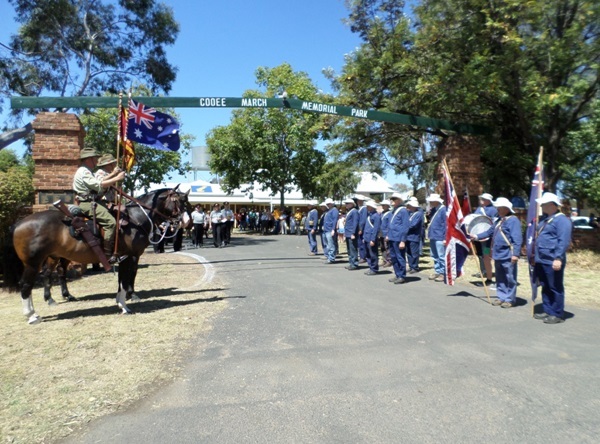 The cemetery was created After the Armistice, and contains the graves of 410 Australian soldiers who were killed in July 1916 during the Battle of Fromelles, and whose bodies were found on the battlefield, but could not be identified. The large area containing the graves is covered with a garden bed containing red rose bushes in this cemetery. 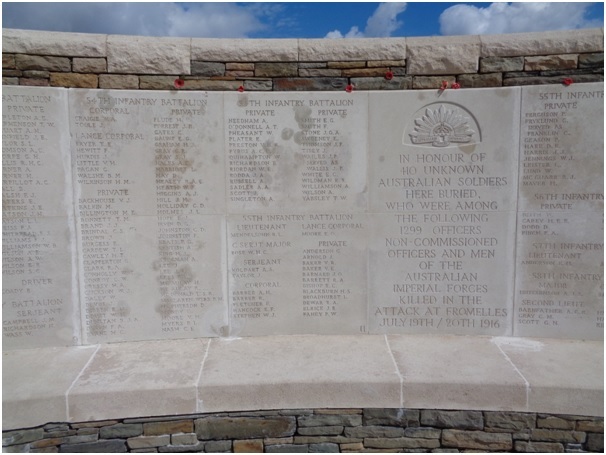 Instead of marking the unidentified graves individually, it was decided to record on a memorial in the cemetery the names of all the Australian soldiers who were killed in the Battle of Fromelles whose graves are not known. There are 1181 soldiers either buried in unknown graves and/or commemorated in this cemetery. Two of the names on the memorial were Coo-ees. 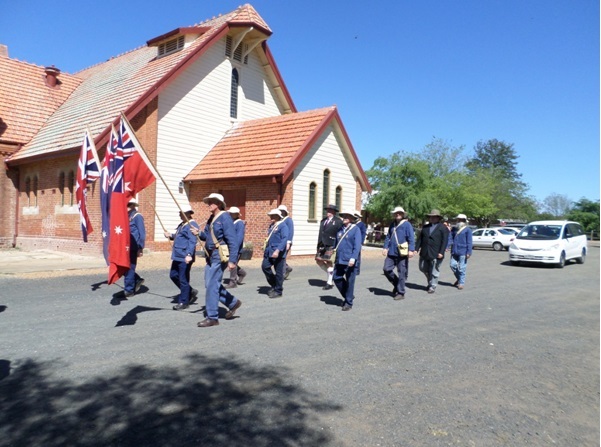 One was Joseph Patrick Wallis (Wailes) who joined the Coo-ees at Dubbo. 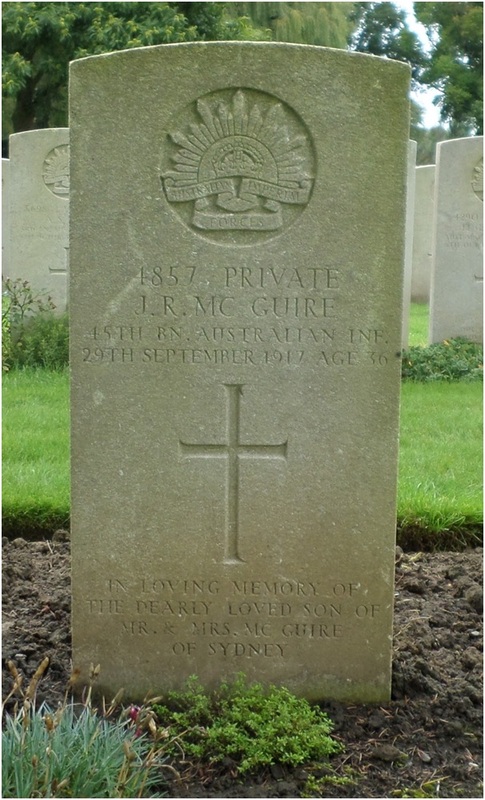 He was one of over a 100 of those named on the memorial whose remains were later identified and re-interred at Fromelles (Pheasant Wood) Military Cemetery in 2010. The other Coo-ee named on the memorial was Charles William Gordon Conroy, who according to his service record was a chemist when he enlisted, and joined the Coo-ees at Orange. He was killed in action at the Battle of Fromelles on 19/20 July 1916. 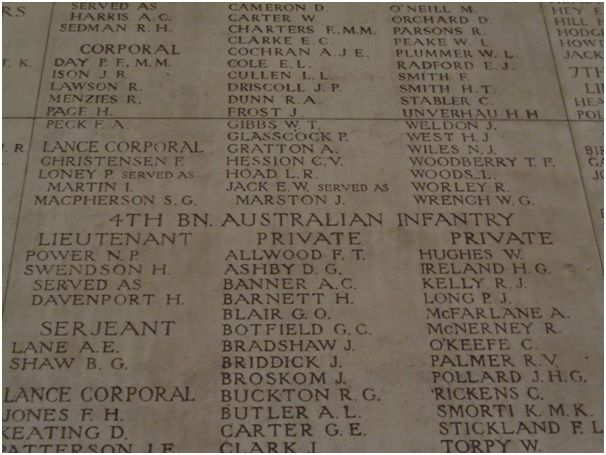 The photograph below shows Charles Conroy’s name (name 10 from the bottom in the left row in the first panel on the left) on the 54th Infantry Battalion’s list of names on the memorial wall at V. C. Corner Australian Cemetery and Memorial. (Joseph Patrick Wallis’ name is on the middle panel). 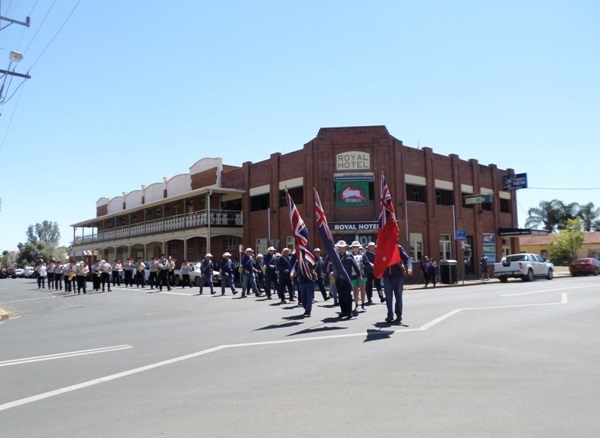 A photograph of the Charles Conroy’s name on the memorial will be placed on his individual blog entry, and form part of a Roll of Honour for the fallen Coo-ees on this blog. 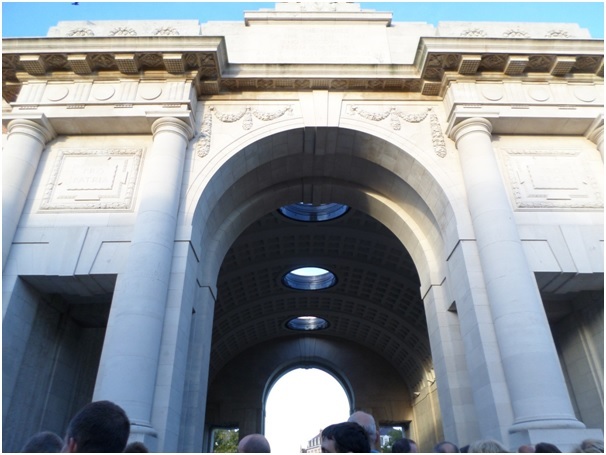 On Friday 29th August 2014 Stephen and I drove to Menin Road South Military Cemetery, which is located 2 km east of Ieper (Ypres), in Belgium. 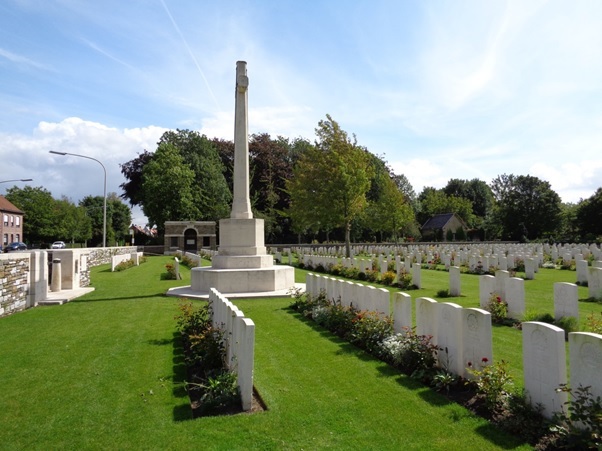 According to the Commonwealth War Graves Commission website http://www.cwgc.org/, the Menin Road ran from Ypres to the front line which changed position only a few kilometres during the war, and this cemetery was always in Allied control. It was used by various units and Field Ambulances from May 1915 to 1918. There are 1657 soldiers either buried or commemorated in this cemetery. 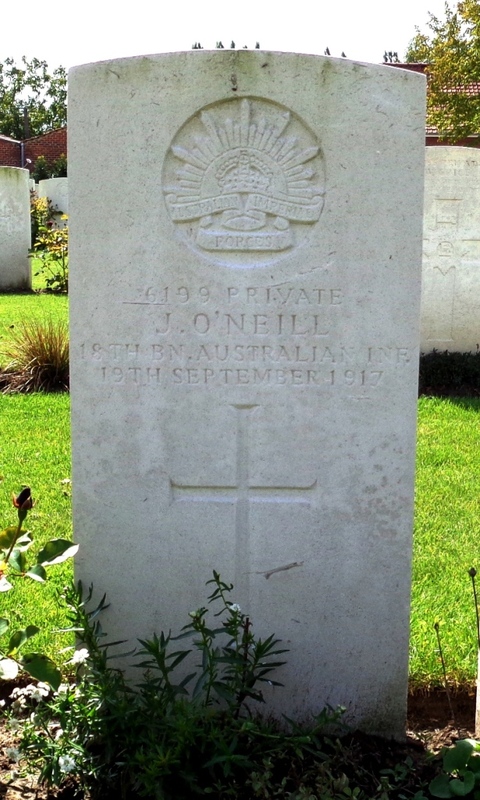 James O’Neill, a labourer on enlistment per his service record, who joined the Coo-ees at Wellington, is the only Coo-ee buried in this cemetery. He died of wounds on 19 September 1917. The photograph below shows James O’Neill’s headstone (2nd from the right) at Menin Road South Military Cemetery. A photograph of the headstone on James O’Neill’s grave will be placed on his individual blog entry, and form part of a Roll of Honour for the fallen Coo-ees on this blog.